“ You are a dynamic being of Light that at each moment informs the energy that flows through you. You do this with each thought, with each intention. Optimum Choices just finished compiling its 2009 IMHA (Immune Mediated Hemolytic Anemia) Recovery Rate at 65%. The mortality rate is up to 80% IMHA, more devastating than cancer. Wellness is a gift; most of us are born Well. While some people are born smart about Wellness (or blessed with early education); they may keep it throughout their life; the reality is that most people will loose it quickly. The statistics show that by mid life most people are in early or advanced stages of degenerative diseases. That is exactly why in this year’s BioNews, I want to share strategies to avoid diseases, maintain Wellness, and introduce shortcuts to regaining Wellness. Surprisingly I will borrow war like analogies throughout my articles because Wellness like a street fight, like a battle or a war can either be won or lost. Likewise, just like Karate, Wellness can be mastered; and comparatively, if a Ninja warrior can easily avoid a street thug, than a Wellness warrior can easily avoid disease. And so that we remember this spirit, my articles will fall under “The Martial Art of Wellness” umbrella. I want to use this warlike language because factually “we are” under attack. We are poisoned daily by depleted, polluted and transformed foods, by pharmaceutical drugs and so many other sources. We are bombarded by television ads and propaganda from various associations and marketers. We are exposed to constant violence with war, murders, disasters; we are stressed from driving, flying, unrealistic work schedules, and from much emotional negativity from associates, friends and even family. Stressors; emotional, mental or physical are a main cause of more than 50% of our toxicity; intoxications which lead to imbalances, even to cancers. And the problem, is that just like with a street thug, soon enough we get beaten up and become unwell. But in Wellness like in a martial art, one can become a Ninja and win the war against disease. We human are born as extraordinary vessel of brilliant pure energy, light and information, and perfectly able to reflect back this energy / light / information to others. We must strive to maintain or regain this pure body and mind. When we are Well we are clear, we can envision our mission, we can achieve our purpose. That is what The Martial Art of Wellness is all about. 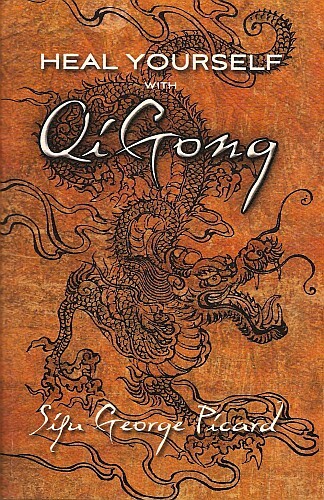 A new book has been published in St. Catharines by local QiGong and Tai Chi Master George Picard. Sifu Picard has students throughout North America who are teaching an ancient healing modality called QiGong. Many of these students, including Medical Doctors and other health care professionals, have experienced firsthand the healing power of “QiGong” as taught by Sifu Picard. His new book “Heal Yourself with QiGong” has simplified Chinese Medicine concepts so that anyone can understand why QiGong is so effective in healing illness. The first printing was sold out to QiGong instructors and schools in Canada and the United States. It is currently in its second printing. In my own pursuit of Wellness I started incorporating QiGong in January of 2007. As a 58 year old marathon runner, I frequently needed adjustment or massages… not anymore since I started QiGong. As a practitioner of yoga for 30 years, I am finding QiGong to be safer and more effective in adjusting and maintaining the spine and much more. I have since learned that thousands of people benefit from the practice of QiGong in so many ways. This month I share with you information on QiGong as part of The Martial Art of Wellness. QiGong can help you with physical wellbeing, mental growth, emotional and spiritual balance. The word QiGong (pronounced “chi gong”) is a combination of two ideas: “Qi” means air, breath of life, or vital energy of the body, and “Gong” means the skill of working with, or cultivating, self-discipline and achievement. The art of QiGong consists primarily of meditation, relaxation, physical movement, mind-body integration, and breathing exercises. For thousands of years, millions of people have benefited from QiGong practice and believed that the function of Qi maintains health and heals disease. In traditional Chinese medicine, good health is a result of a free flowing, well-balanced energy system. It is believed that regular practice of QiGong helps to cleanse the body of toxins, restores energy, reduces stress and anxiety, and helps individuals maintain a healthy and active lifestyle. For more information on Heal Yourself with QiGong visit www.georgepicard.com.